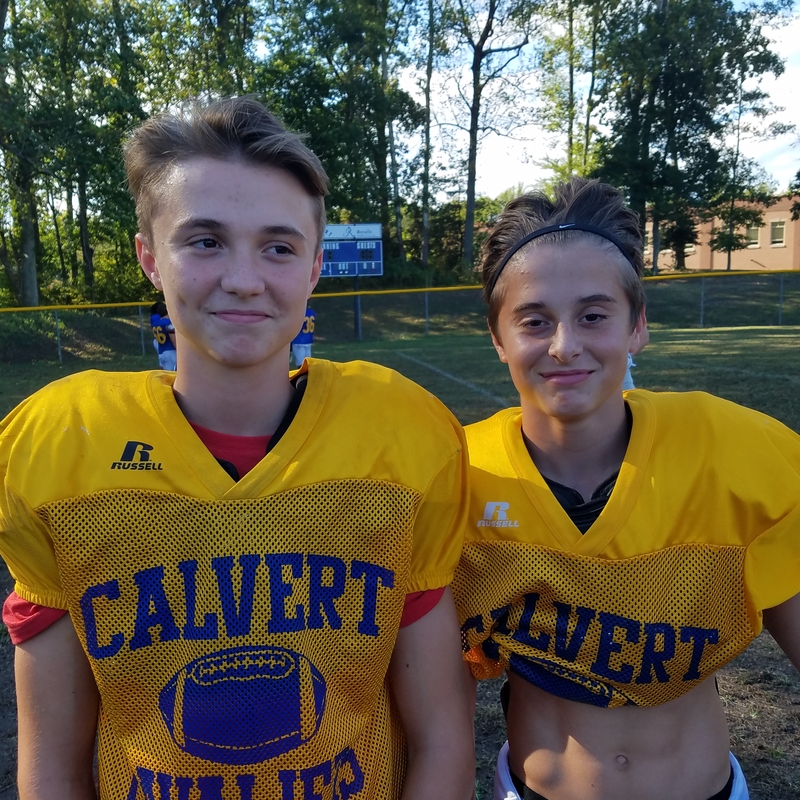 Jacob and Luke Bernard are brothers that play for the Calvert football program. Together they have offered up their perspective of this past week’s contest as a fill in for Ben Lash, our regular bleacher reporter. We are fortunate to get an in game account from two young men who personally devote themselves to the game, both on and off the field, and genuinely love our program. 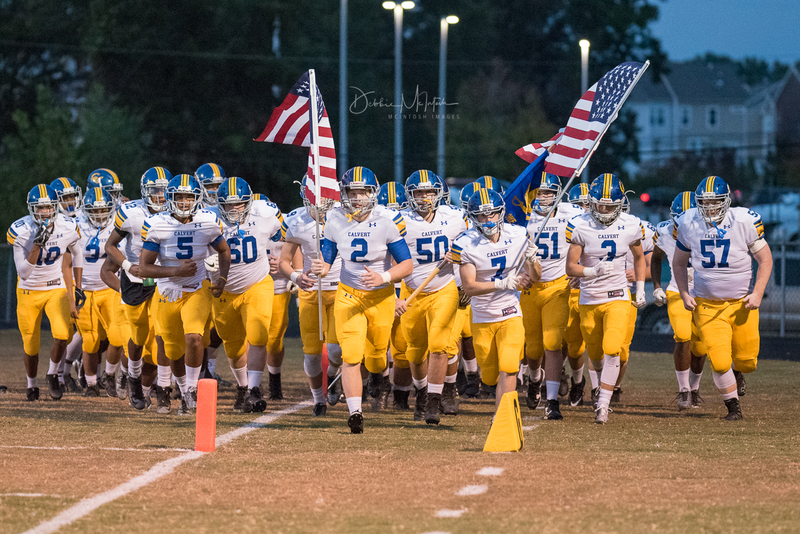 The Calvert Cavaliers took the field on a beautiful Friday evening to square off against the Thomas Stone Cougars. The Cougars are led by former Calvert Offensive Coordinator, Danny Ripple. After winning the toss and electing to receive, Thomas Stone executed a time-consuming drive which was primarily comprised of runs. These runs wore down the Cavs’ defense. This drive culminated with a 2-yard touchdown run straight through the middle of the Cavs’ defense. The Cavaliers offense was nearly non-existent throughout the first quarter. Led by sophomore quarterback, Cade Meredith, the Cavalier’s offense turned in two straight drives, which resulted in three and outs. 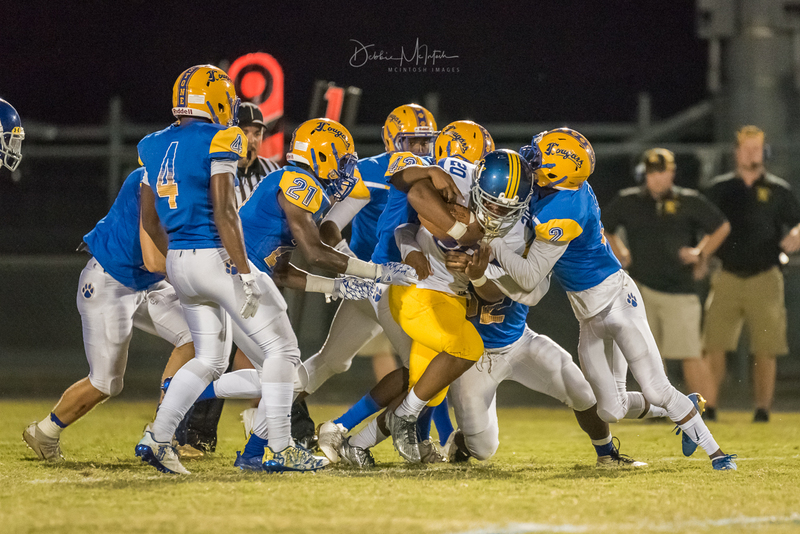 Early in the second quarter, Calvert’s defense began to show signs of life after spending the majority of the first half on the field. 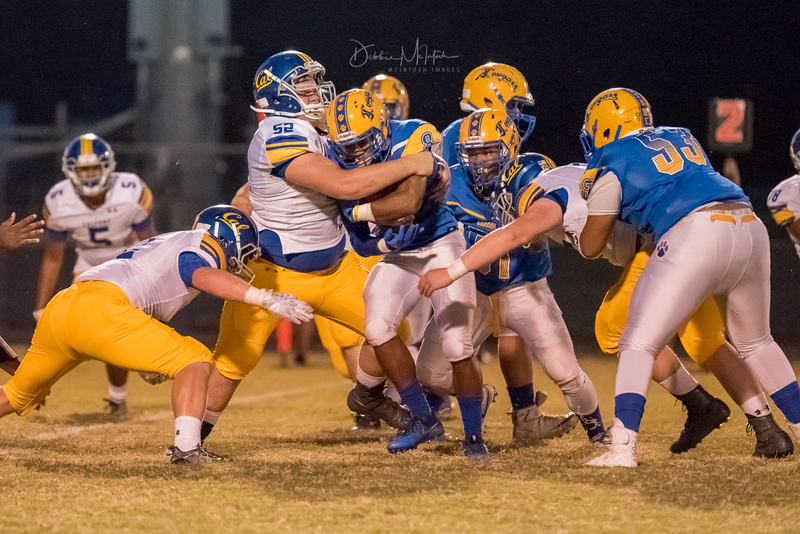 The Cougars were on the move again deep within the Cavaliers’ territory, only to be shut down by the Cavs on a tough fourth down. After taking possession late in the second quarter, Calvert’s Mikka Harvey rattled off a series of spirited runs. These runs resulted in their first extended drive of the game. The drive however was soon ended on a failed fourth down attempt. 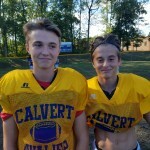 A visibly revived Calvert defense took the field and looked to be gaining confidence. This confidence was soon shattered by a 48-yard scamper by the Cougar’s Hopeton Mair. With only 3:33 left in the half, Calvert put the ball in the hands of Dre Mackall. 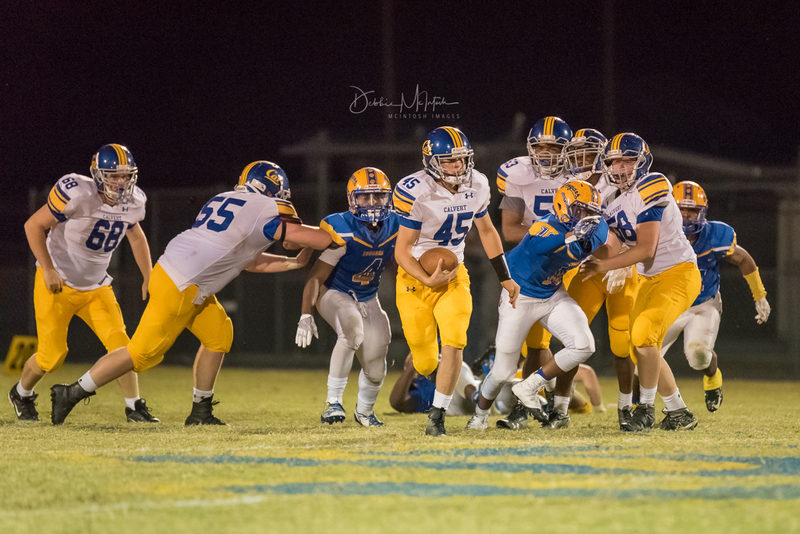 It took numerous Cougar defenders to bring Mackall down as the junior, running back began to impose his will upon the defense which required numerous defenders to bring him down. Unfortunately, while the drive was long, time was short. At the half, the Cavaliers were down 14-0. Throughout the third quarter, both offenses appeared to struggle. It was evident that the Cavs’ defensive unit was showing fatigue after the sheer number of minutes they had spent on the field. However, despite the uphill battle, the unit continued to endure and remained strong. The defense held the Cougar’s to a scoreless third quarter. Early in the final quarter, the Cavs put together a solid drive which took them down to Stone’s 10-yard line. 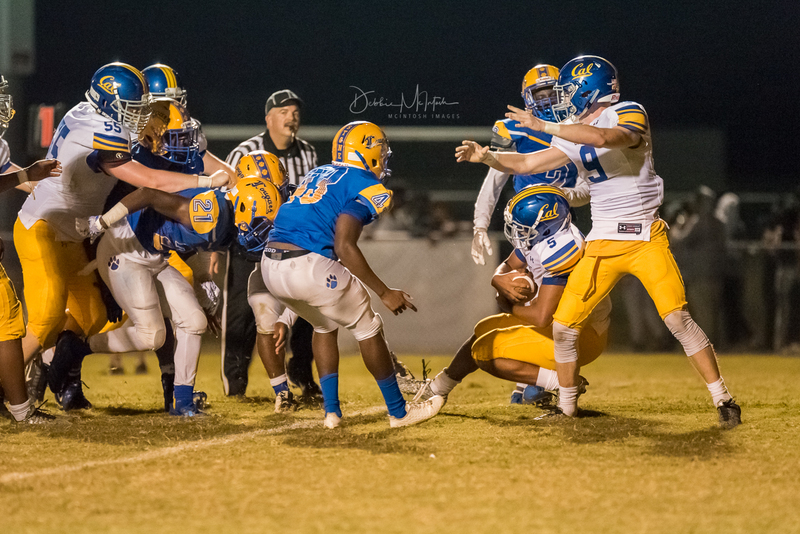 Calvert’s offense was shut down once again by a “bend but don’t break” Cougar defense. 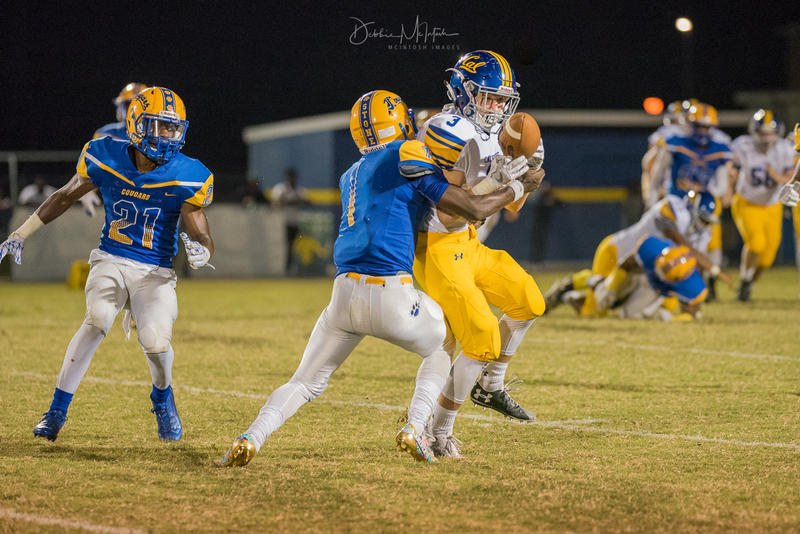 On Stone’s next possession, the dagger was thrust deep into the heart of the Cavaliers when Cougar wide receiver, Hezikiah Hawkins, flew past Corey Watson for an 81-yard touchdown reception. Calvert would eventually get their offense moving. Cade Meredeth connected with RJ Short for a reception deep into Cougar territory. 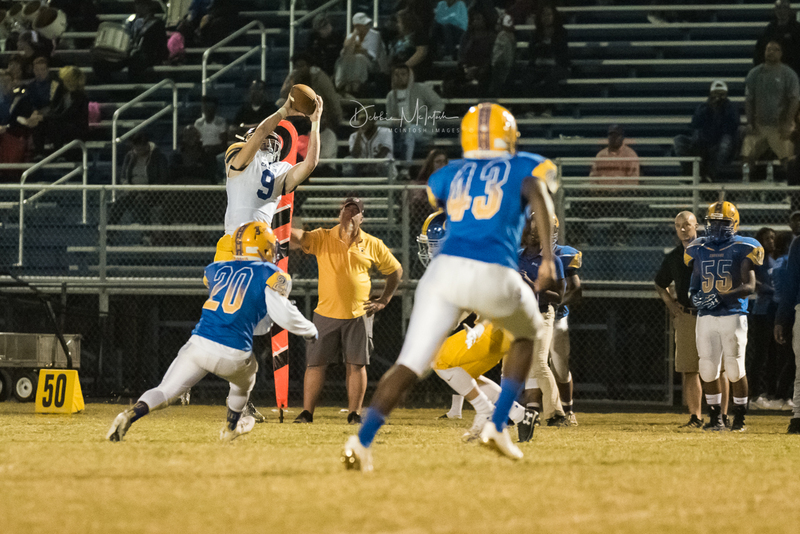 The drive would result in Calvert’s only touchdown of the game by junior, TJ Prather. 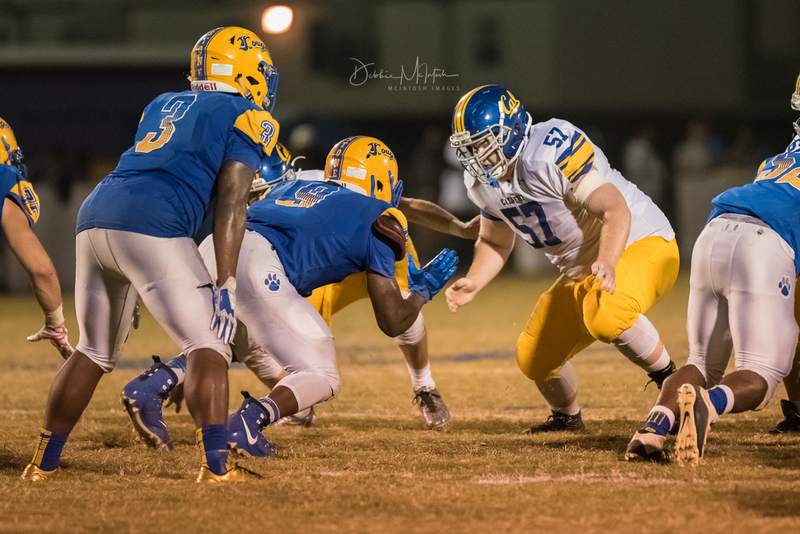 Photos courtesy of Debbie McIntosh, Team Photographer from McIntosh Images.